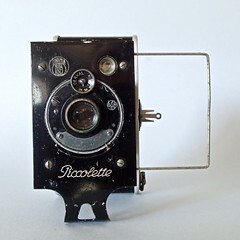 The Piccolette is range of cameras made by Nettel in Stuttgart and its successor companies Contessa-Nettel and Zeiss Ikon. 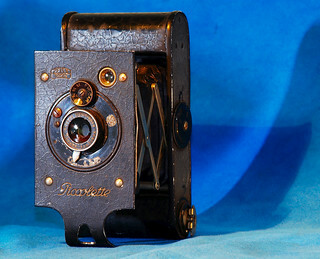 The Piccolette was first made by Nettel, the company which became Contessa-Nettel, as a folding-bed camera for 4x6.5 cm exposures on rollfilm, from 1914. This camera was available with various lenses, including Nettel's own Anastigmat or Rapid Aplanat, and Pronto or Compound shutter. It has radial lever focusing on the bed. 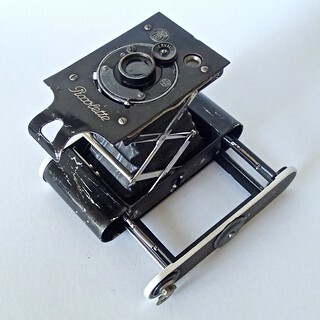 The Piccolette is best-known as a strut-folding camera for eight 4×6.5 cm exposures on 127 film, made from 1919 by Contessa-Nettel in Stuttgart, and continued by Zeiss-Ikon after the merger in 1926 in which Contessa-Nettel joined to form Zeiss Ikon. Production seems to have eased in 1930 or 1931.The total production is unclear at this point. 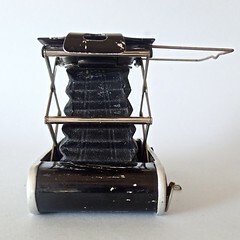 The Piccolette is a very close design adaptation of the Vest Pocket Kodak of 1912; the main differences are a fully-fledged film carrier attached to the removable bottom-plate ensuring that the film vcan be inserted correctly, and the curved wrap-around lower part of the front standard. The Piccolette itself was directly copied in 1925 by Rokuoh Sha as the Pearlette, which in turn was copied by Fuji Kōgaku as the Dianette and Pionette around 1936 . Contessa-Nettel Piccolette with film carrier partially removed. Two models have been observed: Model A lacks a Brillant viewfinder on the front standard. 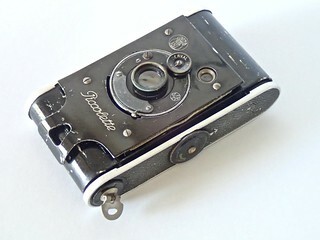 The inscription 'Piccolette' occurs above the lens/shutter unit, while "Contessa-Nettel Stuttgart' appears below. The lenses installed are is fix-focus. 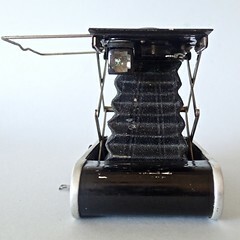 Model B has a Brillant viewfinder incorporated into the top right corner of the front standard. 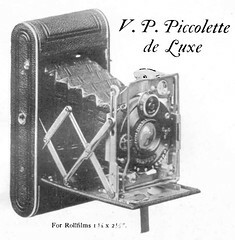 The inscription 'Piccolette' now occurs below the lens/shutter unit and a manufacturer's logo has been added at the top left of the standard. The camera was offered with a range of lens and shutter options in Germany. Additional variations occurred in the export markets. 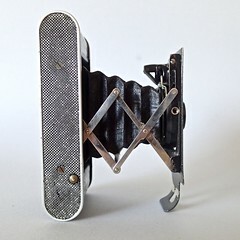 For example, it was common practice among French photo retailers to order cameras without lenses and have lenses of French manufacture fitted. 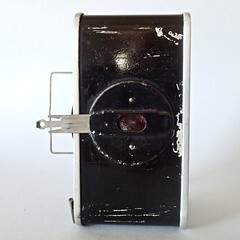 Meyer Goerlitz Doppelanastigmat Citonar 7.5cm f/6.3. ↑ McKeown, James M. and Joan C. McKeown's Price Guide to Antique and Classic Cameras, 12th Edition, 2005-2006. USA, Centennial Photo Service, 2004. ISBN 0-931838-40-1 (hardcover). ISBN 0-931838-41-X (softcover). p714 (Nettel), 215 (Contessa-Nettel) and 1057 (Zeiss Ikon). ↑ Contessa-Nettel Piccolette, with an f/4.5 Tessar and dial-set Compur shutter, at Early Photography. ↑ It is no longer included in the 1931 Zeiss Ikon catalog. —But it is included in French catalogues until 1932. ↑ Catalogue Omnium Photo (Paris) 1926, p. 13. ↑ Catalogue Omnium Photo (Paris) 1922, p. 8; 1927, p. 21.—Catalogue Photo-Plait (Paris) 1927, p. 45.—Catalogue Photo-Sport (Paris) 1923, p. 21. ↑ Catalogue Photo-Sport (Paris) 1922, p. 22. ↑ Catalogue Omnium Photo (Paris) 1927, p. 21.—Catalogue Photo-Plait (Paris) 1927, p. 45. 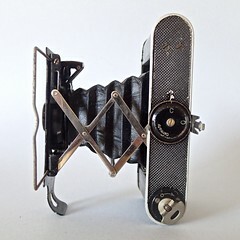 ↑ Seen in on-line auctions.—The camera illustrated in the 1928 catalogue still carries the Contessa-Nettel Symbol: Zeiss Ikon Cameras [Catalogue]. New York, Carl Zeiss Inc, 1928, p. 4. ↑ Catalogue Photo-Plait (Paris) 1931, p. 83. ↑ 1926-1937 Central Camera Catalog. ↑ Catalogue Photo-Plait (Paris) 1928, p. 46. ↑ Catalogue Omnium Photo (Paris) 1928, p. 14. ↑ Catalogue Photo-Plait (Paris) 1929, p. 48. ↑ 1926-1937 Central Camera Catalog.— Catalogue Photo-Plait (Paris) 1928, p. 46. ↑ Catalogue Omnium Photo (Paris) 1928, p. 14; 1931, p. 12; 1932, p. 15; April 1931, p. 18.—Catalogue Photo-Hall (Paris) April 1930, p. 20; May 1932, p. 8.—Catalogue Photo-Plait (Paris) 1928, p. 46; 1929, p. 48; 1931, p. 83; 1932, p. 67. ↑ Catalogue Photo-Hall (Paris) April 1928, p. 22; September 1928, p. 22; August 1929, p. 22. ↑ 1926-1937 Central Camera Catalog.—Photo-Plait (Paris) 1928, p. 46. ↑ 1926-1937 Central Camera Catalog.— Catalogue Photo-Plait (Paris) 1928, p. 46; 1929, p. 48. ↑ Available in light brown and possibly also purple? with matching bellows. ↑ Zeiss-Ikon, Piccolette in fotobox.over-blog In French). ↑ Badged as Contessa-Nettel: Catalogue Omnium Photo (Paris) 1925, p. 26; 1927, p. 21.—Catalogue Photo-Sport (Paris) 1922, p. 22.—Piccolette de Luxe at Early Photography. ↑ Badged as Contessa-Nettel: Catalogue Omnium Photo (Paris) 1927, p. 21.—Badged as Zeiss Ikon: Virtuelles Museum der Wissenschaft. This page was last edited on 20 March 2016, at 14:48.